I remember this time of the year as a special time with young children playing around the house, excited and full of anticipation waiting for Santa’s arrival. But since my own kids have grown, left their safe harbor for college and careers beyond, it just isn’t the same. No longer is there time for the whole family to search for that perfect Christmas tree, judging and debating which tree would look best in the living room corner – and afterwards spending the evening decorating it with our children’s handmade ornaments saved from elementary school Christmas projects. Seldom do we drive around town after the Christmas Eve church service to “ohhh” and “ahhh’ at the houses illuminated with festive colors, first began when it was the only way to get the little ones asleep on the “night before”. And no longer do we frantically wrap the presents after the children fell asleep so they could magically appear under the Christmas tree - just as Santa would had left them. Now it is gift cards and frantic after Christmas shopping - looking for those special bargains on items too expensive or frivolous to purchase during the rest of the year. But it is not all lost traditions. There are new ones. Now every Christmas day the family Skype’s with sisters and brothers, aunts and uncles living back east - while still learning the social protocols of visiting long distance in this strange and curious way. Then afterwards we help serve dinner with friends at Community Meals which always reminds us of the special meaning of Christmas. And whether traditions are lost or gained, my wife and I can be thankful our kids will again be home for Christmas, because we know some day they will be far away creating Christmas traditions with their own families. And we will be left with memories, although faded and torn around the edges, of the wonder and joy of many Christmas pasts. Then one day - maybe, just maybe – it will all return with the sound of little feet once again running around the house as the grandkids come to visit their grandpa and grandma during this special time of the year. The Hardshell Harmony will be playing their entertaining brand of bluegrass next Tuesday the 27th for those who are looking for something to do between Christmas and New Years. And tonight if you have all your Christmas shopping completed, wrapped and shipped, Truman will be playing his country favorites. The doors open at 6:00, music starts at 7:00 and you can skedaddle home by 9:00. Everyone is invited and donations are always appreciated. For this week’s “Remember When” question, how about a Christmas quote and a chance to win a $10 bingo packet for Saturday Night Bingo. 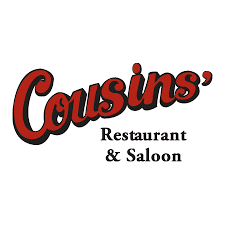 What was the name of the 1954 movie where two army buddies try to save the lodge run and owned by their WWII commanding officer? (In the movie Phil Davis says to Bob Wallace “When what's left of you gets around to what's left to be gotten, what's left to be gotten won't be worth getting, whatever it is you've got left.” and Bob replies “When I figure out what that means I'll come up with a crushing reply.”) Email your answer to the mcseniorcenter@gmail.com, call 541-296-4788 or bring it to the Center with a box of phonograph record of songs written by Irving Berlin”. Well, it’s been another week counting my many blessings. Until we meet again, may all of you have a very merry Christmas. During this season of hope and peace on earth, Tracy and Mark Linebarger, and their many volunteers are once again serving a free Community Christmas Eve Dinner from 3 - 6 PM at St, Mary’s Academy. But unfortunately, as you may have heard, someone is going door to door, asking elderly and shut-ins if they would like a home delivered meal on Christmas Eve and then asking for donations. But Tracy would like everyone to know – that is not the way it works. The only way to request a home delivered meal (or if you have any questions) is to call Tracy at 541-296-3067. And donations to the Christmas Eve Dinner can be made at Columbia State Bank - not by door to door solicitations. But this is an unfortunate reminder that during any time of the year – winter, spring, summer or fall, it is good advice to never subscribe, donate or “sign on the dotted line” from anyone who is going door-to-door. You don’t need to be a victim of another unscrupulous rip-off. You may have missed the Cascade Singers but there are several more musical delights you can savor this coming weekend. Two are scheduled at St. Peter’s Landmark including the annual Community Concert of Handel’s Messiah starting at 7:00 PM on Saturday. Then the next day, Sunday the 18th starting at 7:00 PM, the musical group Barley Draught will create an evening of “unabashed holiday sentimentality” with old-fashioned Irish ballads, Christmas carols, fiddle tunes and stories. For both events, admission is by donation and all proceeds go to the Landmark Preservation Fund. And also on Sunday, but earlier in the afternoon at 2:00 PM, the Gorge Winds Concert Band offers their own brand of holiday cheer with their 11th Annual Christmas Concert at the Civic Auditorium. This is also a donation affair. It is time for the Center’s annual Christmas Breakfast this coming Saturday. 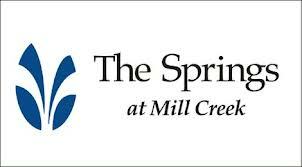 Once again the breakfast is sponsored by Mill Creek Point who have lined up “Harmony of the Gorge” to provide the musical entertainment and of course Santa and his mischievous little helper: Linda. 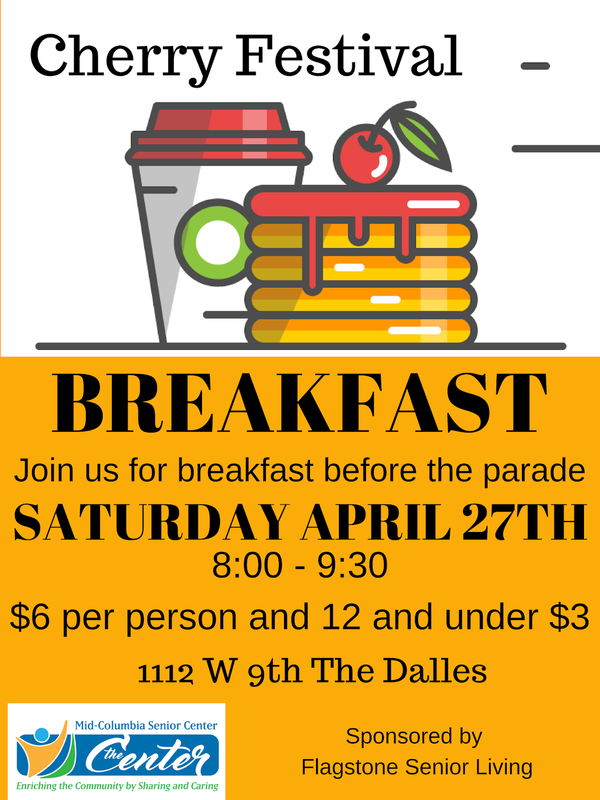 The menu will be flapjacks with fruit topping, scrambled eggs, ham, fruit and your favorite beverage all for only $5.00. Serving starts at 8:00 and will end a little later at 10:00. Because of the success of the last holiday bake sale, Meals-on-Wheels is hosting one more delicious goody sale Thursday the 15th - before, during and after lunch. Every dollar from the bake sale helps support the important work of Meals-on-Wheels. And yes they still could use more drivers. If you haven’t heard the Strawberry Mountain Band you are missing a barn-raising good time. And tonight is your chance starting at 7:00 PM. Then next week you can dance to the smooth sounds of Truman and his Country Gold. Donations are appreciated and everyone is welcome. The book written in 1923 by the Lebanese American artist, writer and poet Kahlil Gabran was “The Prophet”. (And the winner of five quilt raffle tickets is Mary Davis - class of ’63.) But switching from the sacred to the worldly world of football, the college football season will soon be concluding with a crescendo of bowl games. And in football lore it is often heard “Win one for the Gipper.” What school did the Gipper play for and who played him in the movie that made the quote famous? Email your answer to the mcseniorcenter@gmail.com, call 541-296-4788 or drop it by the Center with an original picture of college football’s “Four Horsemen”. Well, it’s been another week looking for one of those three hundred days of sunny skies the chamber of commerce promised. Until we meet again, keep riding herd on life’s little pleasures. This month the Center is kicking off its 2012 Membership Campaign. And I am inviting all of you who have never been a member to cross the threshold and join. And this time I don’t want to hear you have an aversion to getting older (I hate to spill the beans, but you are! ), or are too busy to add one more activity (join the crowd!) or are just a long time procrastinator. Whether you use the Center once a month, twice a week or every day - or if you just read this column, become a member and join an extended family of three hundred engaging, inspiring and adventuress souls (sometimes it is just an adventure getting out of bed). Membership is $35 for an individual or $60 per couple. And for the very first time, we are offering you the opportunity to become a Super-Duper member for $50 or $90 per couple. But you ask, “What special benefits do Super-Duper members receive?” Well, all I can say is the Super-Duper benefits are so Super-Duper secret we cannot even tell the Super-Duper members what they are! You will have to wait and see. Thanks to Patti Blagg for being the first Super-Duper member. You have only until December 17th to buy that winning raffle ticket for the beautiful hand stitched quilt hanging in the Center’s lobby. You can buy ten chances for $5.00 or one for a dollar. And think of it this way. Instead of buying your friends a fruit cake, buy them a raffle ticket. There is a greater chance they will win the quilt than anyone of them eating the fruit cake. You can purchase raffle tickets at the Center’s front desk or at the December 17th Saturday Breakfast. If you are interested in the ins-and-out and the reasons why of county planning, the Center’s Tuesday Lecture on December 13th will feature John Roberts, the Wasco County planning director, who will try to demystify the planning process for you. It starts at 11:00 and afterwards you can enjoy dinner prepared by the Meals-on-Wheels crew. When it’s too tough to make a decision, what do you do? In the grand political tradition, you pass the buck! Well at least that is what we do at the Center every winter. When the snow falls or the freezing rain sticks, instead of deciding whether to open or close the Center, we rely on the good folks at School District 21. So as your annual reminder - if D-21 closes school all the activities at the Center are cancelled, and if there is a two hour delay only the morning classes are cancelled. And even if there are no activities, we will still try to have someone at the Center to answer the phone and offer assistance. Tonight the Sugar Daddies are back at the Center playing adult contemporary hits and a few of their own originals. And next week the Strawberry Mountain Band will set a match to the dance floor playing the well known as well as the hidden gems of country. Donations are appreciated, everyone is welcome and the music starts at 7:00. It wasn’t hard for Al Wynn or Elt Fadness (this week’s winner of five quilt raffle tickets) to remember Les Cunningham the owner and DJ of the first FM radio station in eastern Oregon - and who I am told followed the beat of his own drums. But for this week’s “Remember When” question you may need to scan your library or rummage through your attic once again. The Lebanese American artist, writer and poet Kahlil Gabran wrote in 1923 a book of twenty-six poetic essays that was popular in the 1960’s. What was the name of the book? Email your answer to the mcseniorcenter@gmail.com, call 541-296-4788 or drop your answer off with a bottle of Patchouli oil. Well, it’s been another week keeping hope alive in a dense forest of cynicism. Until we meet again, keep your light on and the noise out.